Your SharePoint Online intranet is a repository for content created and published by a few and consumed by all members of your organization. To increase the relevance and optimize the distribution of information, create site pages to focus the delivery of the information. 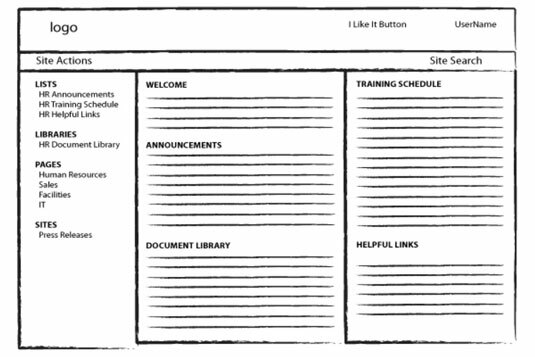 Here is a wireframe that serves as a guide for creating the Human Resources page. The page has five web parts: Welcome, Announcements, Document Library, Training Schedule, and Helpful Links. The following table shows the libraries and lists you first need to create in SharePoint Online in order to build the Human Resources page. You need to do this because you will be displaying web parts on the page, which pulls information from the libraries and lists on the table. The column on the left is what you will be naming the SharePoint template type in the right column. Go to Site Action→Site Settings. Below the Site Actions Group, click Manage Site Features. Scroll down to find the Team Collaboration Lists feature and then click the Activate button. Go to Site Actions→More Options. Click the Announcements icon from the list of templates on the right pane. Enter HR Announcements in the Name text box and then click Create. Follow the same instructions to create the HR Document Library, HR Training Schedule, and HR Helpful Links lists and libraries by using the specified template on the right column of the table. Below Filter By, select Page. Select Publishing Page and click Create. On the Create Page page, enter Human Resources below Title. Leave the default URL name or enter your own. For the page layout list of choices, select (Welcome Page) Blank Web Part page. A new page displays in Edit mode. To add the Welcome message web part for the page, enter text below Page Content. Use the Ribbon commands to format the text. The text you enter here will show up in the Welcome web part from the sample wireframe. Below Header, click Add a Web Part. Select HR Document Library and click Add. Add the web parts in reverse order because the last web part you add is the web part that shows up on top. *Select HR Announcements and click Add. Below Right (next to Header), click Add a Web Part. Select HR Helpful Links and click Add. Select HR Training Schedule and then click Add. Hover over the right of the HR Training Schedule web part title and click the down arrow. Select Edit Web Part to display the Tool Pane on the right. Below Selected View, choose Current Events. Below Toolbar Type, select No Toolbar. Click OK on the web part editing pane. On the Ribbon, click Check In, enter your Comments, and click Continue. If you do not see the Check In icon, click Page on the menu. The page is now saved, but it is not visible to everyone yet. The next step is to submit the page for approval so that it can be published and become visible to everyone in your organization. You may find that the default views for lists and libraries do not quite meet your needs. They either have too much or too little information. You can easily create a custom view. Just go to the list or library, select List or Library from the Ribbon, and click Create View. Choose a format or select one of the existing views that closely match what you are looking for. In the Create View page, enter the view name, select the columns you want displayed, and deselect the columns you want to hide. Click OK.